1. Make cookie dough following your favorite Ann Clark recipe. 2. While the dough is chilling, prepare the egg yolk paint: Separate two or three eggs (one for each color), placing each yolk in a small bowl, and reserving the whites for another use. Add 1/2 teaspoon milk to each yolk and whisk until smooth. Add a few drops of liquid or gel food color to each bowl and blend. 3. Roll the dough out, cut it with your favorite Ann Clark cookie cutters, and place the shapes on a cookie sheet. With a fine tipped paint brush, paint designs on the raw cookies. Bake as directed. Inexpensive plastic brushes (from the dollar store) work great. Because you're starting with yellow egg yolks, the color palette will be somewhat limited. Red, yellow, and orange food coloring all work well; try green for a yellowy green and blue for a deeper, almost teal green. And you really do need to add yellow food coloring to the yolk for yellow paint; unaugmented, the color of the yolk fades as the cookies bake. You can create different effects depending on how thickly and evenly you brush the paint onto the cookie. Paint that's applied very lightly will crack and shrink as it bakes. Heavily applied paint will look darker and somewhat blotchy. Colors will bleed if allowed to run together, although not as much as with a more liquid icing. You can purposely brush colors together, or you can let one color dry for a few minutes before applying a second color. (Egg yolk paint dries fairly quickly.) 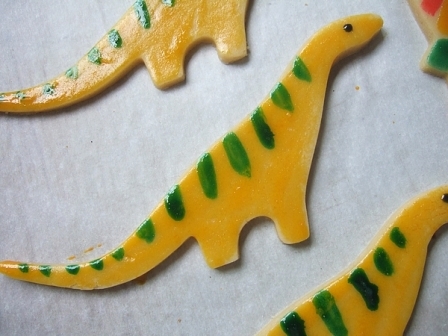 To make the green dinosaurs pictured, I brushed the green color on the dinosaurs' back in a series of V shapes, let the cookies dry for about 5 minutes while I rolled out some more dough, then filled in the Vs with yellow. For the mostly yellow dinosaurs, I simply painted the bodies yellow, then brushed green stripes directly on top.